With the latest release of Wrangler Enterprise, our team drew upon our experience working with large-scale enterprise customers such as Kaiser Permanente, PepsiCo and Royal Bank of Scotland and their needs transitioning data wrangling projects from early exploratory phases into production pipelines. Our initial success in powering data preparation initiatives for customers leads to an expansion of use across the organization and in turn, brings a new set of enterprise requirements around self-service scheduling, manageability and collaboration. This expansion also brings new users and use cases to the platform that need additional flexibility in generating samples and defining higher-level wrangling tasks that are commonly repeated. It’s a great sign when customer success and expanded use accelerates the maturation of your product forward and we couldn’t be more pleased with the direction our customers are pushing us. 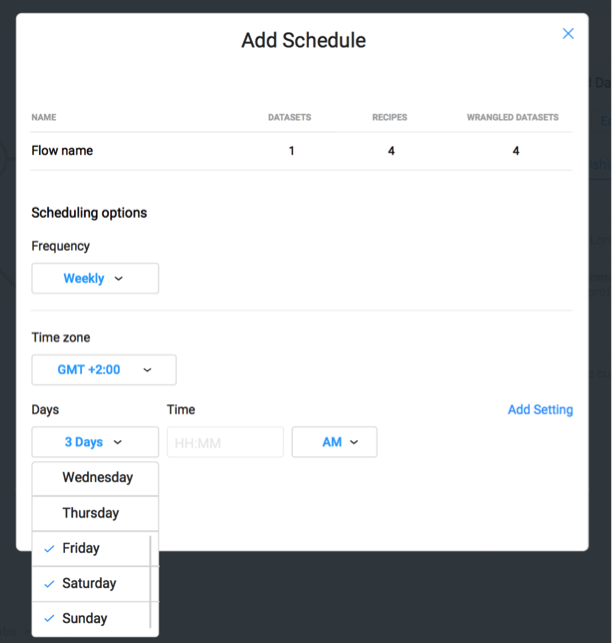 As Trifacta end users define their wrangling recipes in a self-service fashion, it’s critical that they’re also able to more flexibly schedule those workflows to run on a regular basis without requiring extensive intervention from technical counterparts. Whether it’s scheduling a wrangling job to run on a hourly, daily or weekly basis or scheduling it to run every time source data updates, the ability of end users to set up these repeatable processes is critical to transitioning wrangling into production and our goal of making data preparation an entirely self-service process end-to-end. 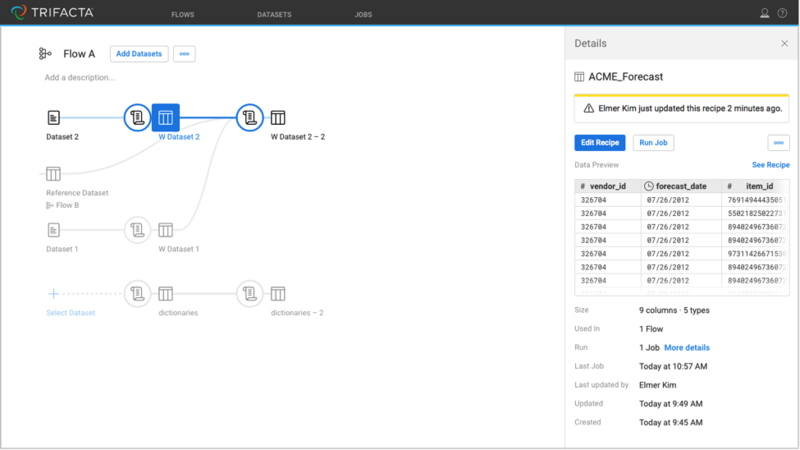 This release also features updates to Flow View, our high-level depiction of the different components of a wrangling workflow – input data, recipes, output formats/locations and all of the dependencies within the flow. 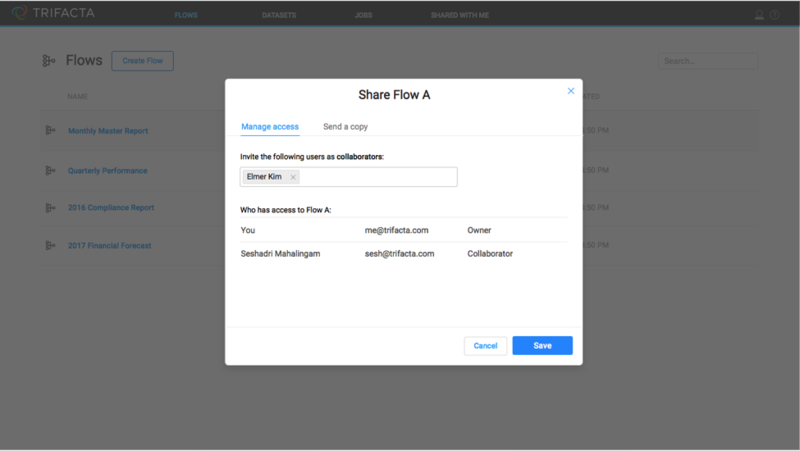 Flow View allows end users to more effectively manage and collaborate around complex wrangling processes that incorporate multiple input and output data sources. When data wrangling projects experience success and start to include a broader range of users and use cases, collaboration becomes critical. Enabling our users to expand upon their ability to share data, wrangling recipes and entire workflows allows a broad range of users to leverage the collective intelligence of the team to generate value from their data. With this latest release, we are enabling multiple users to collaboratively build and edit wrangling recipes with their colleagues. We’ve also made broad enhancements to Trifacta’s sharing model that will serve as the foundation for more contextual collaboration within the product. Enabling end users to interactively explore and prepare data of any shape and size has always been a core tenet of Trifacta’s user experience and one that we enable through the extensive use of sampling throughout our product. This release builds upon our sampling capabilities with more flexibility in leverage a wider range of techniques including filter-based, stratified, anomaly-based and cohort. 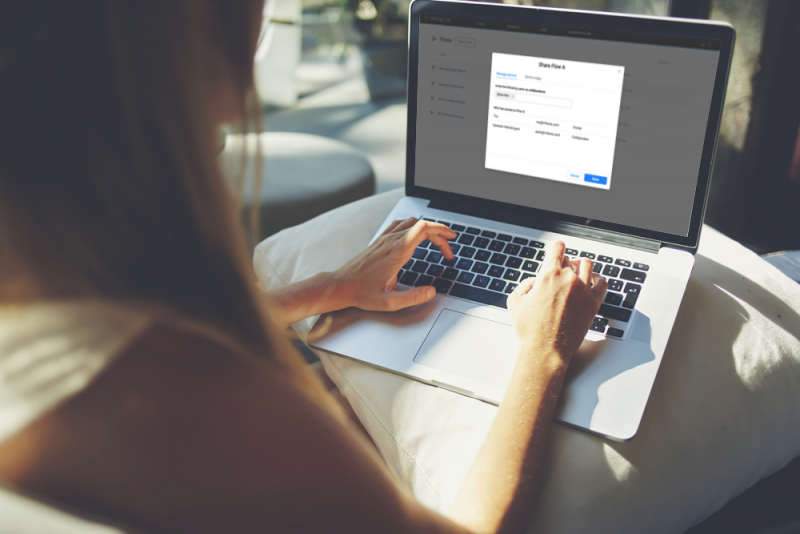 Users will have the ability to select and customize the appropriate sampling technique to leverage based on the makeup of the data they’re working with and how they need to wrangle it for downstream use. 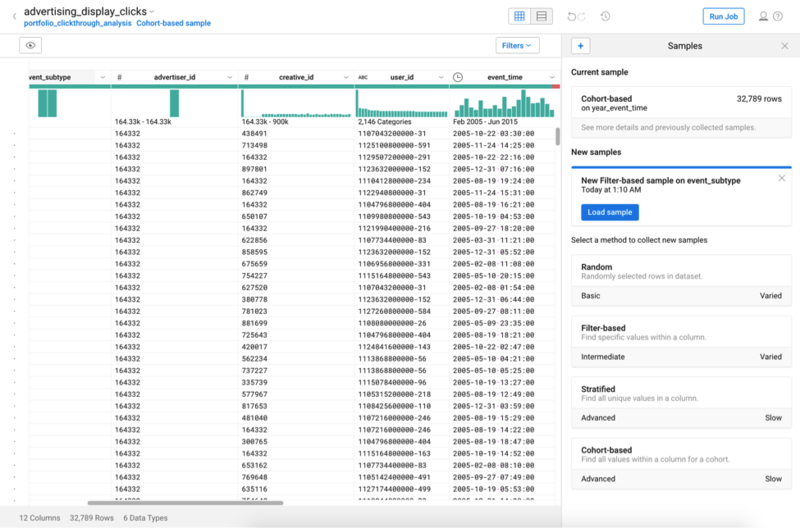 Providing a highly intuitive and efficient user experience for data wrangling is critical to Trifacta’s mission of creating radical productivity for people who analyze data. A major aspect of this is continuing to provide different levels of abstraction for how end users explore data and define wrangling tasks. 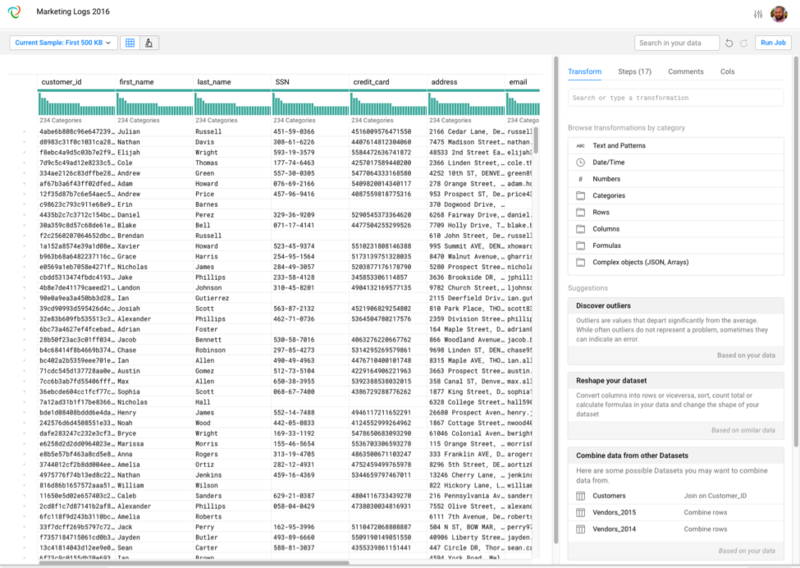 The Spring ’17 release introduces a new contextual panel interface for users to intelligently search for recommended transforms based on their data and define higher order wrangling tasks in natural language that make up several individual steps. It might be helpful to think of Wrangling Tasks as similar to the Macros you would use in Spreadsheets. As with every new release of our Enterprise edition for Wrangler, many of these features will eventually land in the free version of Wrangler in the coming months. For more information on the latest release, check out the official press release or reach out to our team directly to schedule a demo. *all screenshots included in the post incorporate fake data our team mocked up internally.